I wonder if a third day will be the charm? Yesterday during my commute home an old guy was panhandling on the train. He asked for change, I said I didn’t have any. I had my headphones in and was listening to a podcast, so I didn’t clearly hear whatever it was he first mumbled. But as people began filing out he said quite clearly, “I’m gonna spit in your face.” Thankfully, he didn’t and he got off the train at Gallery Place. Today it was a gang of teenagers on a crowded train during rush hour. I’ll say about 10 or so African American teens got on at Gallery Place loudly packing into one end of the train. One of them decided to throw ice, someone complained, and then they decided to push through to the other end of the train. They insulted an African American senior citizen as they pushed through. Once on the other end, they caused some commotion that at few in their party decided to film. The commotion was enough to get a few commuters, including myself, to flee the train when it pulled into Mt. Vernon Square. I reported the incident to @WMATA and MyMTPD and got back the same sort of answer I normally get when I report things. Well, maybe I should walk or get back to biking to work instead? But the problem hasn’t been my commute in. My commute in is more positive/neutral than negative. My commute back is mostly okay but then I have 15 minutes of unpleasantness that pops up from time to time. In the afternoon I’m more likely to encounter rowdy school-kids, drunks, panhandlers, crazy people, trash, and bad smells. My work pays for my commute but sometimes free doesn’t seem worth it. Afternoons like this make me reconsider getting a bike and cutting back on metro. I know ridership is down for various reasons, reasons being people have other options to using public transit. There are days when I could telework, but I’m not as productive at home. I could also try doing 10 hour flex-time days to limit how many times I have to come in. I’m too cheap to use Uber-pool on a regular basis. I’m still a fair weather biker, and becoming more hard-core would help me lose weight. Anyway, there are people who are undermining public transit by adding misery to it. 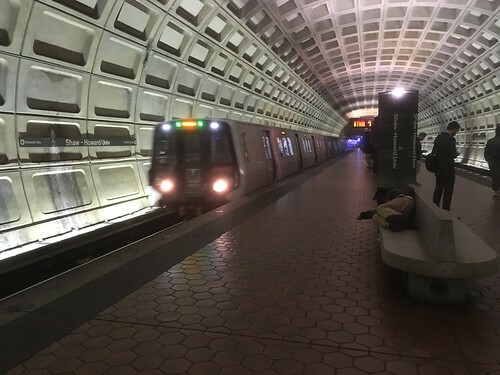 If the people who add to WMATA’s bottom line stop using the system, and decide to stay home, carpool, Uber, bike, walk, or drive their own personal vehicle, it’s going to take longer to get back to good.